There are some changes happening over at IGGPPC for 2015 and it's all very exciting! So in the spirit of doing more activities and getting members more involved, I'm going to be taking over the baking and cooking activities on the site. Which means I'm back to cooking up fandom recipe ideas (get it? haha). I'v decided to make and share a fandom recipe every month based on whatever that month's theme is. This month's theme is Retro Gaming and the recipe options are virtually endless. I ended up making something that I've considering doing in the past - Yoshi's Cookies cookies. When I was making fandom recipes before, Adam suggested trying this but it seemed overwhelming. But after a bit of research and brainstorming I figured out a way to make them. I choose to make a cake mix cookie over classic sugar cookies for two reasons - 1. I've been very busy lately and making classic sugar cookies didn't appeal to me since they are a full afternoon process and 2. 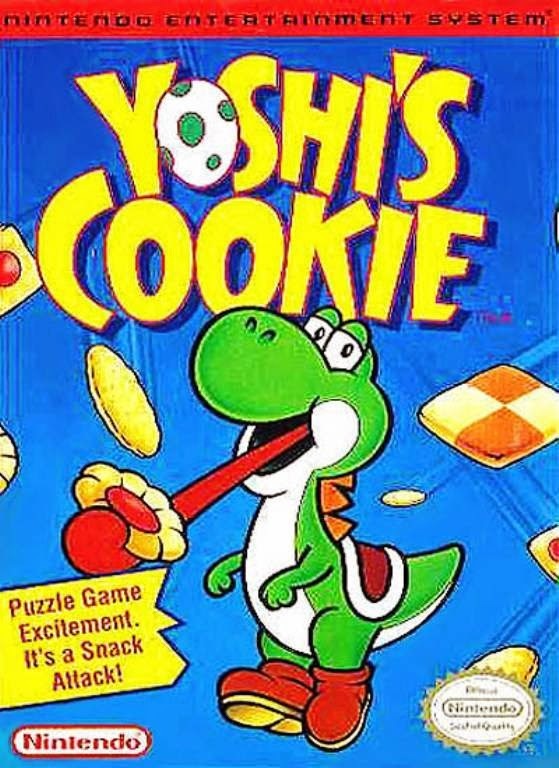 The cookies in Yoshi's cookies cover art look puffier than a flat sugar cookie. 2. Combine butter, egg yolks, and vanilla extract in a large bowl. Blend in cake mix gradually. At this point, my rings were removed and I worked the cake mix in with my hands until the dough wasn't sticky. 3. Roll dough to 1/8 inch thickness on lightly floured surface. Cut with cookie cutters. Place on ungreased baking sheet. 4. For cookies in donut shape, sprinkle a mix of sugar and cinnamon on the cookie before baking. Bake for 6-8 minutes or until edges are light golden brown. 5. Cool 1 minute on baking sheet and then remove cookies to cooling rack. Once cookies are cooled, it's time to decorate. Add the appropriate icing colour to a tablespoon or so of piping gel. Mix well and then either with a spoon or piping bag, make circles, squares, or hearts on your cookies. I found blending the gel with a spoon worked well. I made the brown colour with the leftover purple I had and some yellow and red gel added in. I played around with a lot of ideas for the centres of the cookies. I felt that coloured icing wouldn't be shiny or vibrant enough. I considered using jam or jelly but the idea of buying and opening three different jars didn't sound like a good idea to me. Plus the centre wouldn't really set and I wouldn't be able to stack them up nice in a tupperware container. This is when I though of the container of piping gel in my cupboard. I could manipulate the colour easily, it was inexpensive in case I messed up anywhere, and it would give the shiny texture I wanted. I really love how they turned out! They are a yummy, not too sweet cookie and I love how they look set up like a Yoshi's Cookie level. I've shared the recipe over at IGGPPC and I'm super excited for next month's recipe already (it's a secret!!). I'm also planning on doing another live bake-along in February which should be fun. Have you tried any fandom recipes? These are fantastic! I'm feeling inspired to dust off my Game Boy and have a few rounds of this fantastic classic game. Well done!